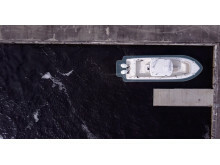 Launched earlier this month with Prestige Yachts at the Düsseldorf Boat Show, DockSense is the recreational marine industry’s first intelligent object recognition and motion sensing assisted docking solution. Docking a boat can be a stressful experience, even for the most experienced captains. The DockSense system uses cameras and video analytic technology to create a Virtual Bumper™zone around the vessel and assist boat owners in tight quarter docking. DockSense continuously monitors the vessel’s surroundings, keeping the autonomous system updated with real-time detection of objects like pilings or another vessel. 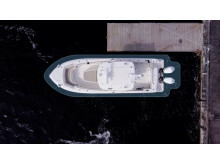 Mercury’s autonomous system works in concert with DockSense and its own joystick piloting system to avoid the object and assist the captain in guiding the vessel to the dock. 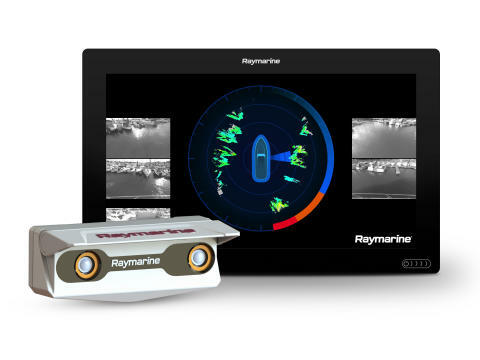 The DockSense system includes multiple FLIR machine vision cameras, a central processing module, and the DockSense App running on Raymarine’s Axiom navigation display. 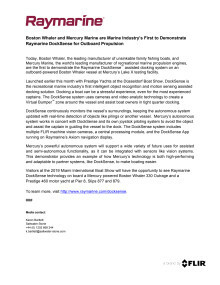 Today, Boston Whaler, the leading manufacturer of unsinkable family fishing boats, and Mercury Marine, the world's leading manufacturer of recreational marine propulsion engines, are the first to demonstrate the Raymarine DockSense™ assisted docking system on an outboard-powered Boston Whaler vessel at Mercury’s Lake X testing facility.